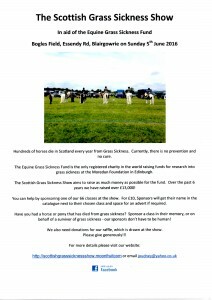 The Scottish Grass Sickness Show is an annual showing show at Bogles Field, Essendy Road, Blairgowrie, held in memory of Sykes, who lost his life to EGS in 2009 aged 4 years. As usual there is a huge variety of classes with a few fun classes thrown in for good measure. 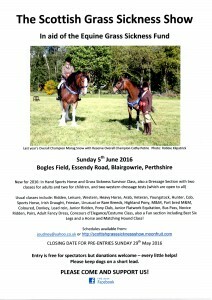 A grand day out for spectators and competitors alike!